If your jaw clicks when it opens, or you can’t fully open it, or you have pain in your face and trouble chewing, then you’re among the 15% of Americans who have chronic jaw pain. Your jaw joint is called the temporomandibular joint, or TMJ. The name comes from the jaw’s role to connect your temporal bone in the skull with your mandible bone. Some people experience short-term pain that goes away with ice and over-the-counter medicine. But if you have chronic jaw pain or you can’t open your mouth, you might have a temporomandibular disorder (TMD) and it’s important to see your dentist right away to find relief. Dr. Yakowicz, Belleville dentist explains more below about the causes and treatments of jaw pain. Pain in your jaw can feel different depending on what’s going on. In order to best understand what’s causing your pain, try to notice when you specifically feel the pain and what specifically it feels like. Do you have tightness, soreness, or clicking? Is the pain shooting sharp or a dull ache? 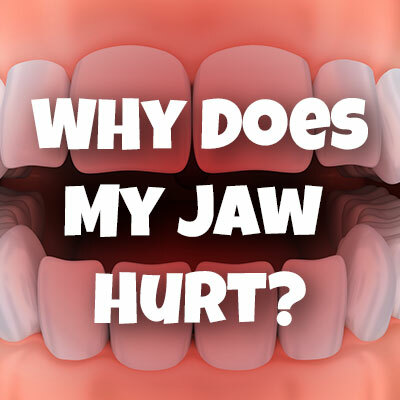 Some jaw problems can also cause pain in your face, head, neck or shoulders. Many patients who have chronic migraines don’t realize it’s actually a dysfunction of their bite and TMJ. It’s important to see a dentist and explain what you’re feeling so that they can offer the best treatment options. Your jaw has multiple parts that work together. The temporal bone and mandible bone join together with a piece of cartilage and a shock-absorbing disk. Pain often results from the cartilage being worn down or the disk being dislodged. Only a professional medical provider can diagnose and treat TMD. Fixing your pain and treating it, in the long run, will all depend on what’s exactly causing the problem. If you’re suffering, we would love to help you. We will give you a full examination including watching and listening while you move your jaw and open your mouth. Sometimes dental x-rays and bite analysis are necessary to learn more. If you have jaw pain or any other oral health questions, make an appointment at Neighborhood Smiles today! Your oral health is key to taking care of yourself and enjoying your life.